2019, marks 31 years after the demise of a former student leader of the University of Nairobi Titus Adungosi. However, all this time, his family, relatives, friends, clan and the whole nation at large has never been told exactly what transpired and happened and caused the death of Titus Adungosi while under the Kenyan prison care. The late Titus Adungosi (pictured R) was born in 1956 as the fifth born in a family of eight children although later his father married two more wives and got twelve more children bringing the total number of children to 20. Adungosi`s father, the late Mzee Longinus Adungosi Oloo, was a prominent farmer in Adungosi who grew bananas on his 52-acre piece of land which Adungosi`s mother Marciliana Nyabole used to sell and also make beer from it to educate his children, Adungosi included. It is also important to note here that Marciliana`s young sister who had come to help her with house chores later became her co-wife after she got married to the late Mzee Oloo. Family members say the family led a good life owing to the fact that their head was good at farming and therefore was able to provide for his family. Back to the late Adungosi, he started his primary education in 1965 at Chakol Boys Primary and later joined Butula Boys for his O level education before joining Agoro Sare High School in Oyugis for his A level education. At school, Adungosi liked reading and researching and as such he did not take part in any sporting activity. However, Adungosi was a great artist and his family members say he could draw his teachers, fellow pupils and students as well as visitors who visited their home place. He was also a class perfect while in primary school which according to his half brother Fredrick who is also a Reverend in the Anglican Church, he did well. Fredrick also remembers Adungosi as the greatest discipliner in the family who could not leave his young ones to go astray. “Titus used to cane us seriously whenever we went wrong and you could not joke around when he was there,” he recalled. The discipline that he instilled in his young ones made us cope up with life easily and most of our family members were used as good examples. He adds that Adungosi was also a smart person and he liked associating with people regardless of their status. Because his mother used to brew beer, he also took some little beer until 1979 when he joined the University of Nairobi and stopped taking beer suddenly. The late Adungosi was dating a white lady whom the family members suppose he was planning to marry although it never came to be bearing in mind what followed in 1982. 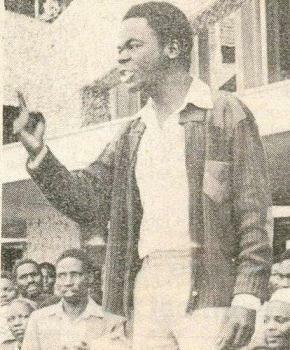 In 1982, the late Titus Adungosi was a third-year student in the Faculty of Architecture, Design, and Development at the University of Nairobi and the first Chairman of the University of Nairobi Students Organization (SONU) before he was arrested and convicted by the then Chief Magistrate Mr. Abdul Rauf for 10 years imprisonment for sedition on the September 24, 1982 after the failed Kenyan military coup of August 1, 1982 attempt against the former President Moi’s regime. His imprisonment was widely covered by the media and the AP ran his story under the headline: ‘Kenya Jails Student Leader’ published on September 25, 1982. According to the family, he was first imprisoned at the Kamiti Maximum Prison before being transferred to the Naivasha maximum prison where he fell ill and died at the Kenyatta National Hospital. The family further says family members used to visit the late Adungosi at the Naivasha prison and that he was fine and in good health. They say the last time they visited him was towards the Christmas season of 1988 and he had assured them that he would be freed in two months time. Adungosi`s half brother Fredrick explains that as a family they have never come to understand what really happened to the late immediately the family members who had visited him in prison left because what followed afterward was the news of his death. “We suspect there was a foul play in the death of Adungosi because nobody has ever brought to the limelight what happened,” adding that the family of Tito Adungosi still remains optimistic that the government will help it uncover the truth surrounding his incarceration and death to ensure that justice prevails. The family says it has never even got any information from the University of Nairobi relating to the controversial demise of their son. Adungosi’s mother Mariciana reveals that the family was not allowed to perform the traditional Iteso cultural rites to Tito during his burial and the family was barred from neither taking photographs nor keeping any for his remembrance. She says in a mourning mood that her life changed immediately her son passed on and she has had to go through rough times especially when she remembers how she laboured so hard to have her son excel in life. She argues that if Adungosi was a live, the family status would not be the way it is now because her son had set a very good foundation for the success of the family. She further blames many people especially politicians who have been visiting Adungosi`s place and promising to assist the family but later on disappearing without extending any helping hand. The Teso Community still remember him as a tough-minded leader who fought for changes besides advocating for education in the community. Titus Adungosi died in 1988 as a result of the torture we underwent during this time. The late Titus Adungosi hailed from the Ikatekok clan of the Iteso. 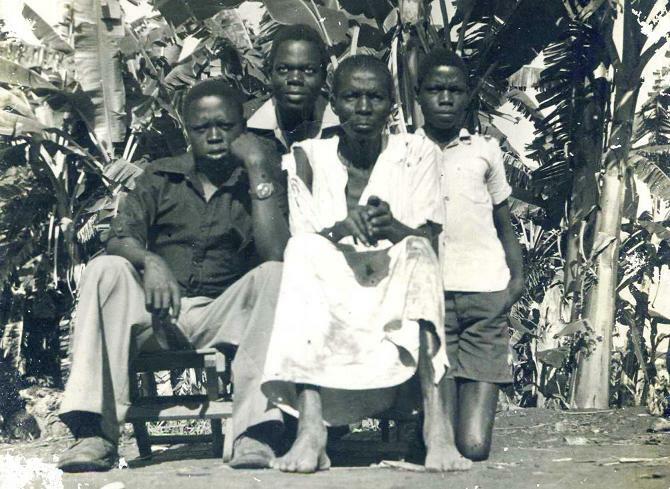 Adungosi`s father got the name Oloo from the Luo community. Family members say the name was acquired from a Luo boy who was adopted by Adungosi`s great grandfather. One of Adungosi`s great grandmother did not have any child and as a result, they had to adopt a child by the name Oloo who was a Luo. However, family members also argue that Iteso and Luo communities share some names owing to the fact that they are all Nilotes Adungosi` mother is now aged 101 years. Whenever Iteso had ceremonies they would share meat, food where one group would chop off their share and go with it. That is how they got the name Adungosi. During the Truth Justice and Reconciliation Commission (TJRC) hearings in Busia County in July 2011, the family of the former Nairobi University student leader, Tito Oloo Adungosi who died while serving a 10 year jail term for his involvement in the 1982 coup attempt, urged the commission to aid them unravel the mystery surrounding his death. National Secretary of Victims and Survivors Network Okodoi Maskini Odero, who is also the family spokesman, informed TJRC commissioners led by presiding chair Tecla Namachanja, that they suspect there was a foul play in the demise of Adungosi, who was a resident of Alomodoi village in Teso South district. “Nobody has ever told us the cause of his death, despite having contacted the Prime Minister who on his part said the cause of his death was that his lungs were punctured while in Kamiti prison where he was being confined,” said Odero, adding that no postmortem examination had been conducted to establish the cause of the death. The family spokesperson added that no one had ever informed the family about the demise of the former chairman of the Student Organization of Nairobi University (SONU) a situation that caused a lot of concern to the Teso community. The fiery, outspoken and radical first SONU chairman Titus ‘Tito’ Adungosi was sentenced to 10 years imprisonment for sedition on 24th September 1982, soon after the failed Kenyan military coup of 1st August 1982. He died in prison under mysterious circumstances on 27th December 1988 and since then; nothing has ever been said concerning his death. He also called for a monument to be established in Busia County to remind the future generation of a martyr of the second liberation. “Though he did not live to enjoy the fruits of his labor, an institution should be set up to immortalize his name,” Odera told TJRC. He believes that if the commission takes the attention expected of the memorandum which the family presented to them, the truth will be ascertained to ensure legal action is taken against the perpetrators. He said that Adungosi was a third-year student in the faculty of architecture, design, and development, was jailed on September 24, 1982, for his activities during the abortive coup attempt, before he was later convicted by the then Chief Magistrate, Mr. Abdul Rauf. On her part, the late Adungosi’s mother Marciana Adungosi accused the former regime for interfering with the burial arrangements forcing them to go against the traditional burial rituals of the Teso community. Marciana aged 101 years, however, appealed to the government to investigate the circumstances that led to the death of her son. They are calling on the government through the Truth Justice and Reconciliation Commission (TJRC) to establish a monument in Busia County to remind the future generation of a martyr of the second liberation, besides setting up an institution to immortalize his name. The late Titus Adungosi (backrow left) and his father Longinus Adungosi Oloo (front row right) in this undated family photo. At the other spectrum, West Media’s review of the life and times of the late Titus Adungosi revealed that Titus Adungosi was indeed a born again Christian at the University of Nairobi. That is not the material of which student leadership is made of. The likes of James Orengo, the late Ooki Ombaka among others. At the time of Titus Adungosi’s death in 1988, the then acting Commission of Prisons James Mareka said that Adungosi died at Kenyatta National Hospital on 27th December 1988 where he died of intestinal obstruction caused by a stomach ulcer. It is apparent that no inquest was held as required by the law where a prisoner dies while serving a sentence. At such an inquest presided over by a magistrate the circumstances of the death are interrogated to determine whether the death was due to natural causes or anybody is to blame for the same. Without the inquest, it obviously meant that whatever the prisons department said was the cause of death became the official position? One of the students who were victims of the Moi dictatorship and crackdown on students in the 1980s and more so after the 1982 coup, Mr. Onyango Oloo says that Titus Adungosi was a right wing born again Christian who incidentally was close to the KANU regime. That after 1982 coup attempt and the crackdown on students, he met the late Adungosi in the Nairobi Law Courts as fellow suspects pending determination of their cases and who (Adungosi) told him that those people (the prosecution) had promised him probation if he pleaded guilty to the sedition charge against him. Mr. Onyango Oloo says he warned the late Adungosi that they were cheating and setting him up to a trap. That Adungosi fell for the trap, pleaded guilty, and he was sensed to ten years imprisonment. Mr. Onyango Oloo asserts that he once again met the late Adungosi at Kamiti Maximum Prison where he was waiting for the determination of his appeal to the High Court and that together with other student prisoners like Ogego, Kolale and university lecturer Maina wa Kinyatti and others they urged the late Adungosi to make up for his earlier court gaffe by relentlessly pursuing his appeal and standing up for fellow university student prisoners but alas the late Andugosi declined that option and repeated his earlier pledge of allegiance to KANU and Moi and his appeal was dismissed and he went to serve the sentence and died before he had been released. It is thus interesting that the same KANU and Moi for which the late Adungosi appears to have gravitated to after his arrest, jailing and imprisonment did not have time for him and indeed he died under the deplorable health standards, the neglect of the basic health rights of the Moi dictatorship prison system of Kenya which system obviously when it must have sensed about the late Adungosi’s diminishing health at Naivasha they dumped him in the equally then neglected Kenyatta National Hospital. In Kenya’s 1988 geopolitics, a prisoner being sent to Kenyatta National Hospital was tantamount to being thrown in the medical wasteland where one died under the false veneer of being treated when no such treatment was possible and nobody cared worse for a prisoner. The final answer as to the cause of the late Titus Adungosi’s death may only be unraveled by an official inquest or through the Truth Justice and Reconciliation Commission digging deep into the medical circumstances, the health situation of the late Adungosi at Naivasha Maximum Security Prison and at Kenyatta National Hospital. The family of the late Titus Adungosi is, however, too humble to pursue any civil claims for compensation for its son who was the only beacon of hope. Several of the Moi dictatorship detainees, prisoners have in the recent past been able to pursue successfully compensation for suffering through the infringement of their human rights. Are there any institutions, human rights organizations, and lawyers who can take up the case for the family of the late Titus Adungosi? Paragraph one the year has been updated from 2011.